When a group of young musicians share their love of music, the legends come back to life. Ranging from Dr. John to Earth Wind and Fire, Otis Redding to Sly and the Family Stone, the Quincy Avenue Rhythm Band plays the classics with enthusiasm and attitude. Along with passion, these Kent Denver students also have the credentials of a serious group of musicians. Not only have individual members received recognition on both the state and national levels, but the band was named the Best High School Blues/Pop/Rock Group in the country by Downbeat Magazine, the “bible” of soul and jazz, in 2006, 2009, 2010, 2012, 2014, 2015, 2016, and again in 2017! We’re not just talking about any group of talented kids here. We’re talking about a band that’s played for tens of thousands at the 2008 Democratic Convention held in their hometown of Denver, CO. We’re talking about a band that’s toured and performed not only throughout Colorado, but on stages in New Orleans, New York, Miami, San Diego, and Memphis. The band has appeared at the Capitol Hill People’s Fair, the official start of summer festival in Denver, every year since 2007, performing for over 200,000 each year! In the summer of 2014 the band was invited to perform at the Montreux Jazz and Porretta Soul Festivals in Europe! We’re talking about a band that’s been featured multiple times on local TV station KUSA, and has performed on local radio stations KUVO and KGNU. We’re talking about a band that has released three CDs -2005’s “Superstitious”, 2008’s “Sing a Simple Song”, and 2011’s “Express Yourself.” By any other measure we’d be talking about a successful indie band, but we’re talking about a band with a median age of fifteen! 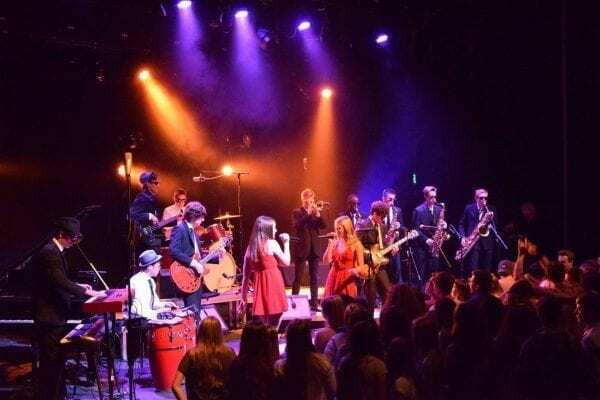 From the Loyola Jazz Festival to the BB King’s Blues Club on world famous Beale St., Quincy Ave. knows how to make a crowd groove, how to have a good time, and how to leave the audience wondering how a group of kids can sound that good! As long as Quincy Ave. continues to make people tap their toes and bob their heads to the grooves of James Brown and Michael Jackson, the band will base its success on one thing: the music.